Squid reminds me of mediterranean cities, they remind me of the ocean, the blue sky and sunny and hot vacation days. Lately, I have been missing all those flavors and emotions…it is sunny in San Francisco, the rain finally stopped but still I wish I was somewhere on a Greek Island. I don’t think I could live on an island, but for a month vacation exploring the nature, I certainly think I could do it. I found some fresh and beautiful squid at the Berkeley Bowl and figured let’s go crazy on the fish, and so I did. Besides a ton of squid, I found that Hawaiian moonfish (opah) which was very white and had a very delicate meat and very soft…and so I am set for my weekly fish/seafood consumption. My favorite part of the squid are the tentacles. I used this recipe base which is the grilled red pepper/tomato salsa with shrimps and it goes well with any type of seafood. The trickiest part of this recipe is stuffing the squid with the spinach/crumbs/olives mixture. It gets a little moist and it’s a little difficult and messy to stuff the squid with it, but with some patience, it eventually gets in. Also to close the squid cavity, some people use toothpicks, unfortunately I did not have any so I used a needle and a sewing thread and it worked perfectly. This is a very flavorful and delicious dish, and can be served as tapas, as appetizer as main dish with white rice, its use is quite versatile. First start grilling the bell pepper, wash it and place in the broiler at high temperature for about 15 min, turning each side until the skin gets well grilled. Remove from oven and let cool. Then remove the skin and cut the pepper in small cubes, about 1 cm wide. Set aside. 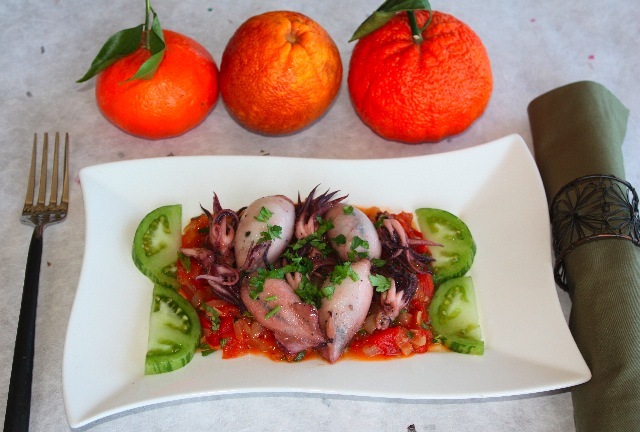 In the meantime, clean the squid, remove the skin, remove the tentacles and remove the eyes of the squid with a scissor, remve the little membrane inside the squid and wash with running water. (Sometimes, you can find squid that is already cleaned, so for those who are not comfortable with the cleaning process, it would be an alternative, but I don’t mind to clean it myself). Set it aside and pat dry. For the stuffing, cook the pancetta for a few minutes until it gets a little crunchy but not overcooked. Defrost spinach and place in a mixing bowl. Add pancetta, olives and pepper. I did not add salt since the olives and pancetta are already salty and it worked fine. Mix all ingredients together and start stuffing the squid with the mixture. When this is done, heat olive oil in a pan, add shallots, let cook for about 10 minutes until translucent at medium heat and keep stirring, add the chopped tomatoes, the chili and cook for about 3 minutes (until no tomato water is left in the pan), add garlic, and stir to get the fragrance out. Add honey and keep stiring for 3 seconds, then add vinegar, salt and pepper. In another non stick pan, heat up 1 tbs of olive oil and add the squid, cook at high heat for about 10 min, or until cooked but do not overcook or it will get chewy. 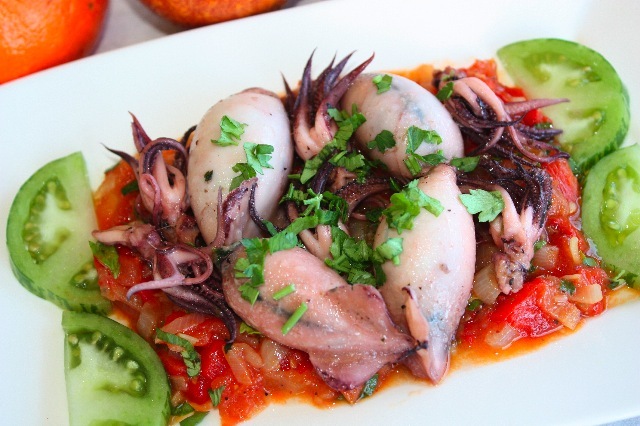 When the squid is cooked, place 2 to 3 tbs of salsa in a plate, top with 6 squid each (if served as an entree), sprinkle with parsley and serve hot with rice or as is. This entry was posted by silvia on February 28, 2009 at 12:05 am, and is filed under Fish/Seafood. Follow any responses to this post through RSS 2.0.You can leave a response or trackback from your own site. hv never done stuffing though. your dish is beautiful, i gotta try it! Well done with the needle & thread! My favorite part of squid is the tentacles, too. What a beautiful stuffing! The saltiness of the olives and pancetta would compliment the squid beautifully. IIRC, Alton Brown of Good Eats fame suggested in one episode that you use the end of a wooden spoon to turn the squid inside out after removing the outer skin, but before stuffing the beastie. That way, instead of the natural tendency of the orifice to grow during cooking, it’ll get smaller and keep the stuffing in place. He didn’t bother with toothpicks, let alone needle and thread. Btw, there’s a membrane of connective tissue on the inside of the squid that can get rubbery. If you use the wooden spoon trick, you can remove this membrane prior to stuffing. Alton also mentioned that the fins are pure connective tissue, so he cut them off and discarded them early on.